The 2018 VR/AR Global Summit in Vancouver, B.C. last week offered an exciting snapshot of where the Augmented Reality industry is right now - and where it's headed. 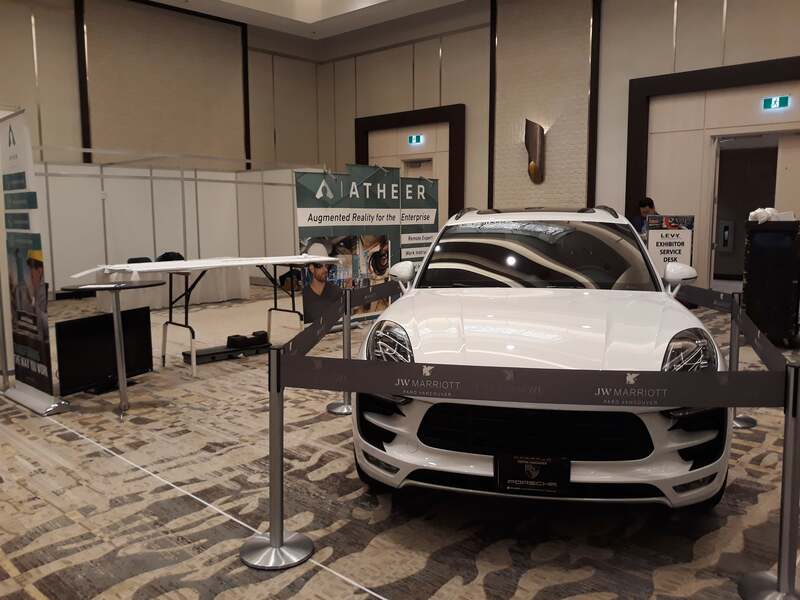 Atheer was delighted to be a part of the international gathering, with three members of the Atheer team involved in speaking at the event and a 2018 Porsche Macan on display at the Atheer booth. The Porsche Macan, generously loaned by the The Dilawri Group of Companies for the duration of the event, provided a great way to underscore the pioneering work that Porsche Cars North America is doing with Atheer and smartglasses supplier ODG to empower Porsche dealership technicians and the company's technical support team to shorten service resolution times by up to 40 per cent. Away from the Atheer booth, Chief Operating Officer Amar Dhaliwal joined Parm Sandhu, Director of Network and System Operations at Canada's TELUS Corporation, and moderator Kris Kolo (the VR/AR Association's Global Executive Director) to explore how TELUS is beginning its journey to using AR and getting a broader Atheer perspective on enterprise AR adoption. TELUS is the fastest growing telecommunications communications company and #1 health IT provider in Canada. Parm said he is looking to AR as an important tool to empower his field service workforce as they work travel the country maintaining and upgrading the company's vast telecommunications network. "I run the field the service operations for our core network services that are used to deliver networks that provide all of our end services: internet, TV, voice and telecommunications services," he explained. "Primarily the use cases we are looking at are in field service - how can we improve the reliability of our network so that our customers can see a faster repair time? How can we avoid sending experts out to the field? How can we leverage technology more effectively so that we're not having to send key team members to remote sites? These are great examples of where we are trying to deploy AR solutions." Amar then offered some insights on what he has seen more broadly from enterprises deploying AR, what factors have been necessarily for them to succeed and the areas of businesses where AR seems to be in greatest demand. "We see a set of key uses cases - companies that say help us with service, help us with dealer service, help us with maintenance and repair operations, help us with training and certification and help us with warehousing and logistics," he explained. We'll post further pictures and links to videos and talks from the VR/AR Global Summit as they become available. Thanks to everyone who visited us - and we look forward to following up with you further about what you saw. Next stop: the 2018 Enterprise Wearable Technology Summit (EWTS) starting on October 9, 2018 in Austin, Texas. !